Reprocessed Medical Devices Market size was valued over USD 1.0 billion in 2016 and is expected to witness more than 14% CAGR from 2017 to 2024. Reprocessed medical devices market is anticipated to witness robust progress over the forecast timeframe. Rising number of cardiac surgeries coupled with numerous blood pressure monitoring applications are foremost factors driving industry growth. Risk of acquiring infection associated with the reprocessed medical devices is relatively lower as in comparison with the reusable medical devices. 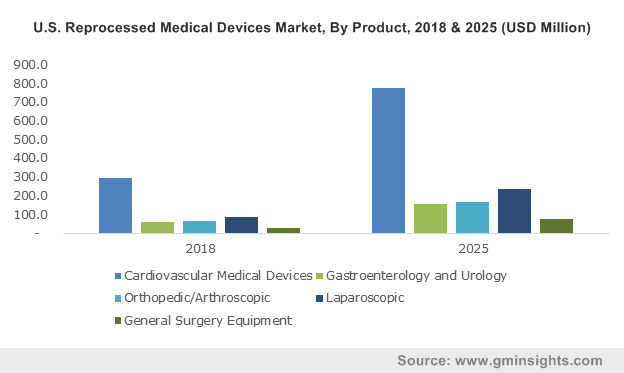 Enormous number of these reprocessed medical devices are in use and these include, endoscopes, surgical forceps, cardiac stabilization and positioning devices, balloon inflation devices, and many others. Increasing incidences of chronic conditions that upsurges the adoption rate of surgical procedures and thereby, reprocessed medical devices market exhibits significant growth. Costs of reprocessed device can be nearly half the cost of new device, opting reprocessed devices is cost effective. Reprocessed device costs less as compared to new devices thereby, resulting in cost reserves for hospital this stimulates the market growth. Obtained savings from reprocessing can be invested in research, new treatments along bedside, and improved patient care such aspects propel demand for reprocessed medical devices. Reprocessing is mostly used for minimally invasive disposables and surgical devices, it saves on landfill costing as well as reprocessing is beneficial for hospitals in repurchasing costs and to reuse devices. Most of the hospital waste is originated from operating room. However, the risk of surgical site infections is restraining factor for reprocessed medical devices industry growth. Cardiovascular reprocessed segment is growing substantially due to increasing prevalence of cardiac diseases that lead to cardiac surgical procedures. Availability of reprocessed cardiac products in vast number that provides cost savings boosts business growth. Reprocessed cardiovascular devices include diagnostics electrophysiology catheters, blood pressure cuffs, cardiac positioning, and stabilization devices, having applications in various cardiac surgeries as well as blood pressure monitoring applications upsurges revenue share of cardiovascular segment. The electrophysiology catheters held largest revenue share as a result, of high number of tests performed and associated advantages such as, reviewing intracardiac electrical capacities in rodents, and diagnosis of irregular heartbeats or arrhythmia. Laparoscopic segment is projected to grow lucratively owing to rising demand for minimally invasive methods coupled with increasing laparoscopic surgeries. Moreover, many surgical procedures are preferred by minimally invasive surgeries (MIS) technique, that can be performed laparoscopically. Aforementioned includes, repairs of inguinal hernias undertaken laparoscopically such factors upsurges reprocessed medical devices market growth. Hospitals held substantial revenue share due to rising number of surgical procedures coupled with increasing adoption rate of reprocessed medical devices by hospitals. Reprocessing saves nearly half of the equipment costs in case of hospitals thereby, increases hospitals segment business growth and this drive the market during the forecast span. Ambulatory surgical centers (ASC) segment will grow significantly as a result of, increasing number of surgical procedures in outpatient settings such as, ASC’s coupled with increased adoption of reprocessed medical devices in ASC’s. Moreover, without any need to compromise on any aspects regarding standards of care management, ASC’s can save costs on surgical procedures thereby, propelling business growth. U.S market accounted for largest revenue share in 2016, and will grow significantly during forecast period. Growth is attributable to increasing prevalence of chronic diseases, rising records of MIS performed annually, and augmented consumer awareness levels for MIS. 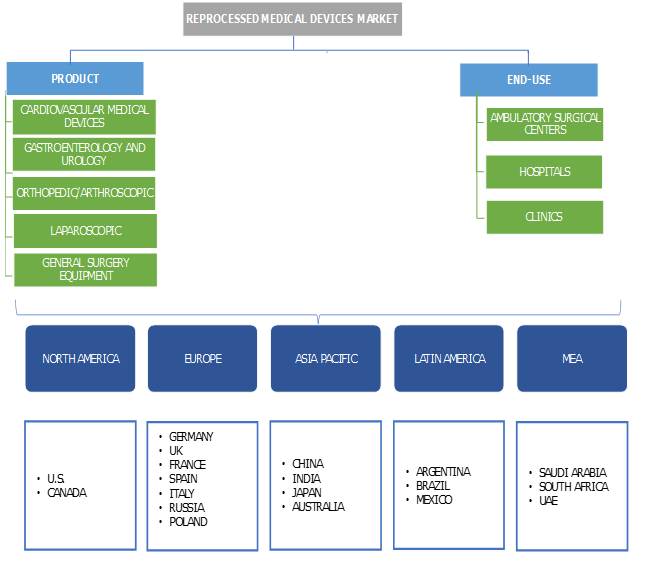 Germany reprocessed medical devices market exhibits significant growth due to economic, sustainable, and safe reprocessing availability, along with suitable governing framework. Moreover, in Europe the overall business will experience considerable growth due to supportive associations that upsurge the reprocessed medical devices market growth. For instance, the European Association for Medical Device Reprocessing (EAMDR), represents and promotes interests of research institutes, associations, and companies involved in reprocessing. Additionally, EAMDR through its publications provides information on reprocessing of medical devices, it also actively involves in developing regulations, guidelines, and standards. Asia pacific is projected to observe lucrative growth owing to rising investment by companies in emerging countries such as, China and India for setting the manufacturing facilities as well as efforts at cost decrease. Furthermore, growing awareness in emerging countries regarding advantages associated with reprocessed medical devices encourages customer buying behaviour. Some of the prominent players operating in reprocessed medical devices market include GE Healthcare, Ethicon, Medline Industries, Innovative Health, Vanguard, SureTek Medical, Medtronic, ReNu Medical, Soma Technology, Stryker and Teleflex Incorporated. The industry contributors implement several strategies such as, merger and acquisitions to expand revenue share and enlarge product portfolio. For instance, Stryker Sustainability provides reprocessed harmonic shears that has adaptive tissue technology specified for soft tissue cuts while nominal thermal wound and bleeding control. Reprocessed medical devices industry is extremely competitive and major factor accountable for increasing demand of reprocessed medical devices is the related low price. Reprocessing encourages industry competition, decreases medical waste generated from operating rooms as well as reduces waste clearance costs. Reprocessing provides the hospitals, insurers and government to manage and decrease healthcare costs. Strengthening network of distributors in developing economies along with high adoption rate of reprocessed medical devices offers robust future growth opportunities for business players over the coming years.